Steve Lucas submitted this Mystery Friday Foto. -Identify this section of the Long Island Motor Parkway. -Which Motor Parkway Bridge is in the aerial? -What buildings are under construction? -Approximately what year was the aerial taken? - What other major roads are in the aerial? -What other historic structures are in the aerial? The farm used by Creedmoor State Hospital from 1926 to 1975for rehabilitation of patients, growing fruits and vegetables for the kitchen at the hospital, and for growing ornamental plants and shrubs for the Creedmoor campus. Today, the farm is the Queens County Farm Museum. 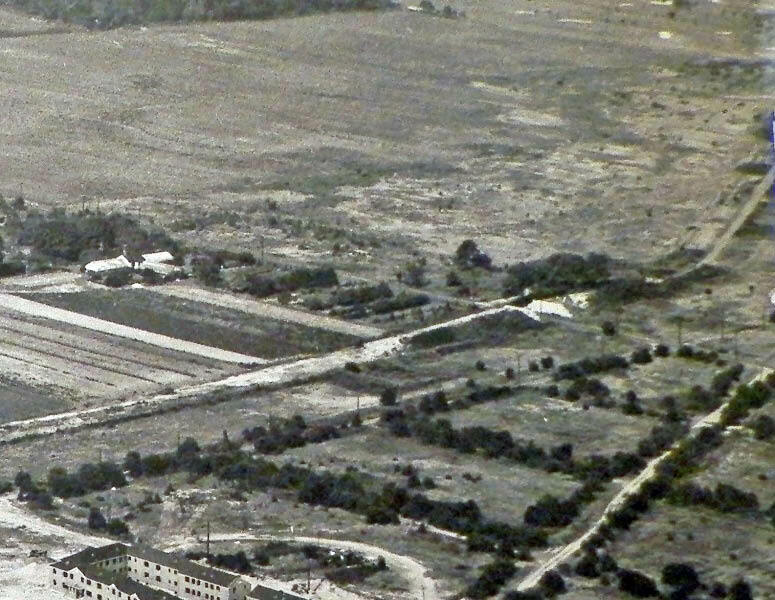 The Glen Oaks Club can be seen in the upper right-hand corner, now the location of North Shore Towers. Congrats to Greg Oreiro and Frank Femenias for correctly answering all the Mystery Foto questions. Kudos to Joe Oesterle and Jerry Giarratana for answering all the questions correctly except the year or bridge. If you have a suggested Mystery Foto, please send a jpeg to Howard@Kroplick.com. Four years after the Motor Parkway closed, the renamed Little Neck Parkway Motor Parkway Bridge was taken down. 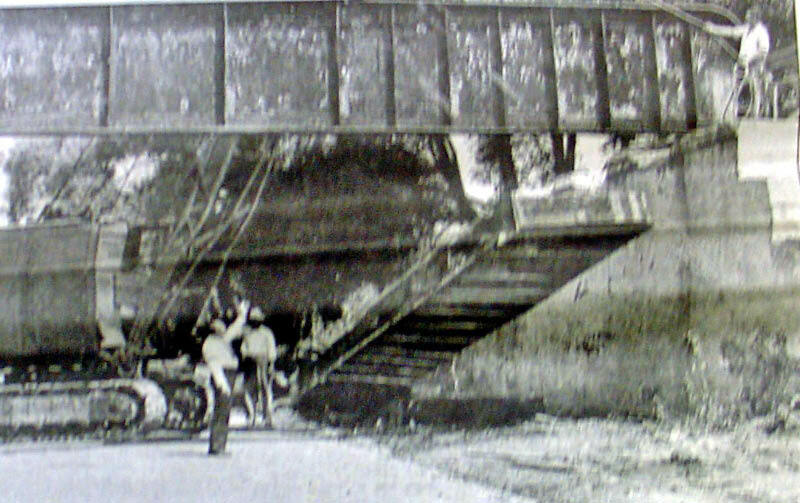 Queens Borough President James Burke can be seen here directing the salvaging of a 14-ton steel girder from the bridge on June 30, 1942. Glen Oaks Apartments being constructed. My grandparents lived here in the1950s. This was a fun one. Thank you Steve Lucas. LIMP - Queens NY, bridge over Little Neck Parkway. Looking NE. 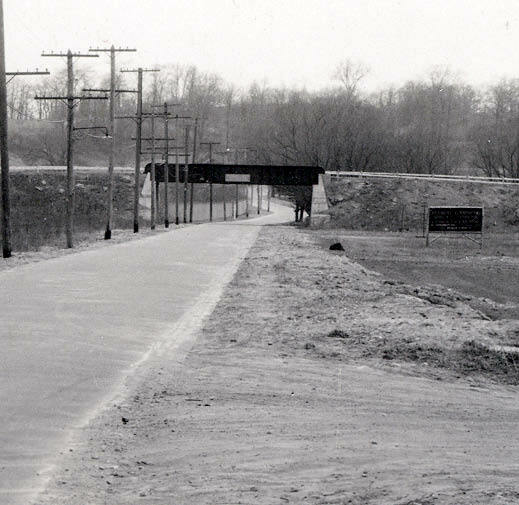 Year - Before 1942, Little Neck Parkway Bridge is still up. Roads - Little Neck Parkway. Historic Structures - Old Queens Farm House, Golf Course, now part of North Shore Towers. Leave it to my fellow cartography enthusiast Steve to come up with an awesome aerial! But, being the like-minded, quirky cartography enthusiast that I am, I was able to come up with it pretty quickly! Immediately East of Commonwealth Blvd through Glen Oaks, Queens. 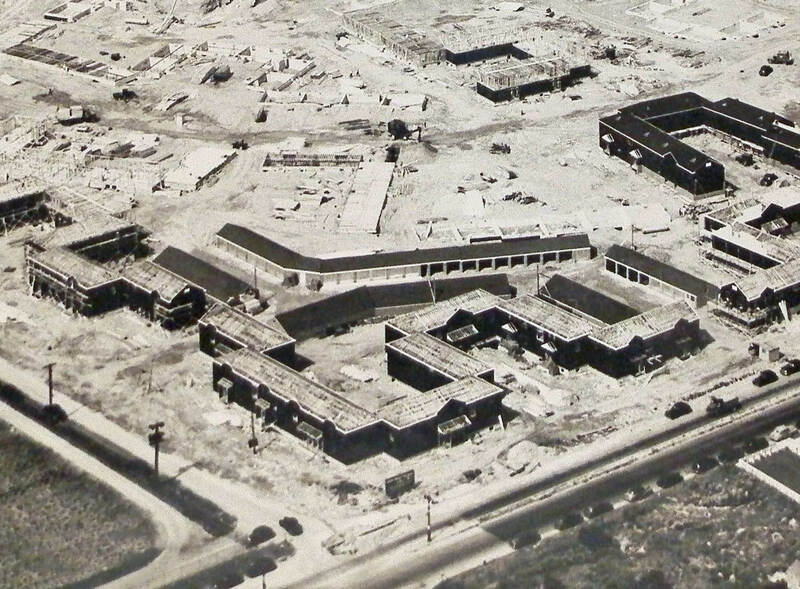 To be exact on when the aerial was taken, Glen Oaks Village was constructed in 1947. It looks like you may have cropped Steve’s photo a bit, but Union Tpke runs along the bottom of the new construction, Commonwealth Blvd along the Western side, and Little Neck Rd (later Pkwy) a little further on the Eastern side. The dirt road leading away from the construction towards Little Neck Pkwy will become Shiloh Ave.
-What other historic structure is in the aerial? Glen oaks garden apt after WWII 1946. Bottom pic commonwealth and union tpke bridge is over nhp road. 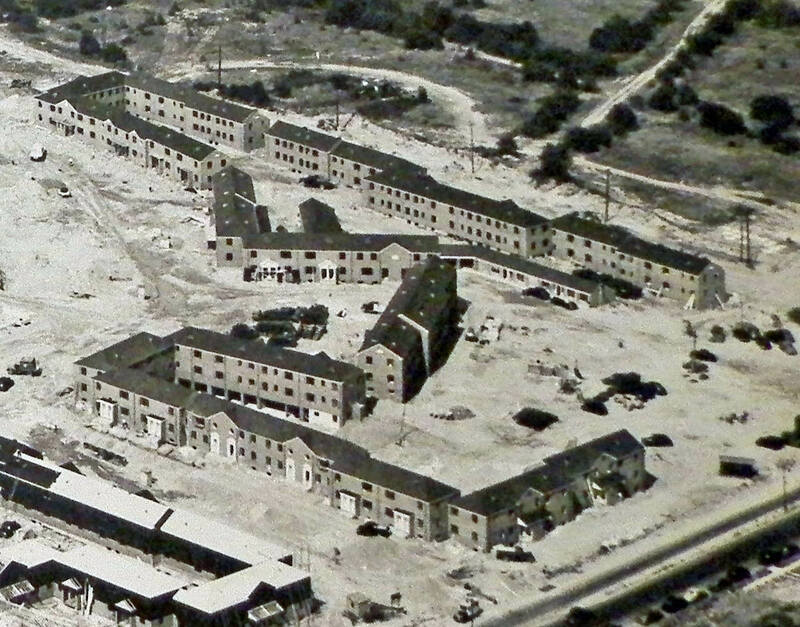 Ariel shot is 1945-46? Other structure is really hard to determine but possibly creedmore? Almost didn’t get this. Glen Oaks Village apts looking NE, and the LIMP at the Little Neck Parkway Bridge. Admiring all the open space! Historic Queens County Farm Museum to the north on Little Neck Pkwy. I’m guessing the 40’s based on the vehicles in the construction pics. The diagonal tree lined dirt road is Shiloh Ave and was just truncated to make room for the apartments. Union Tpke and Commonwealth Blvd are in the construction pics. I recently biked through these apartments and recognized the oval shaped street in the construction pic. Thought ya lost me ha?Not a chance. No computer yet,it’s being looked at,to see if I need a new one,I think I do,so you won’t be hearing from me as much as you usually do. I know of this,I used to live and work in Queens. Just to let you know,I know that you sent me an e-mail about the Marty Himes Museum invitation in December and that I definitely will be going. All have a very Happy Holidays!